THE thought of autumn leaves conjures up images ofNew England, with its crisp air and hillsides bursting with color. Leaf peepers in North Carolina annually crowd the Blue Ridge Parkway, and in Virginia, the Skyline Drive. Upstate New York is known for bursting color from the Hudson Valley to the hills south of Buffalo. 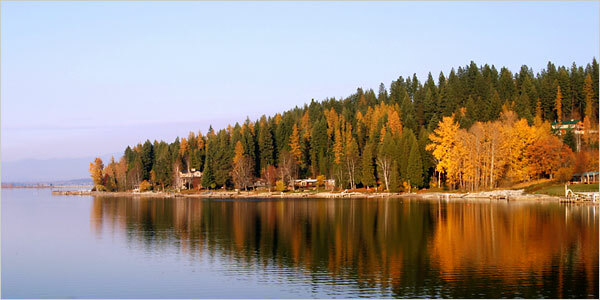 In Idaho, leaf lovers in the know drive the Pend Oreille National Scenic Byway, which runs east from near Sandpoint, around Lake Pend Oreille, lined with birch, aspen and tamaracks, along the Clark Fork River and on to the Montana border. On the Teton Scenic Byway, southwest ofYellowstone National Park, the yellow of aspens mixes with the green of Douglas firs and pines against a mountain backdrop. A version of this article appeared in print on October 6, 2006, on page F2 of the New York edition with the headline: Bright Leaves, Big Country.